What is a Personal Locator Beacon? This page started out real dry and technical, but I’ve totally reworked it to make it more assessable and easier to read. This section will give you the background necessary to understand the recommendations which come later in the e-book on how to increase your odds of being saved from a distress situation. 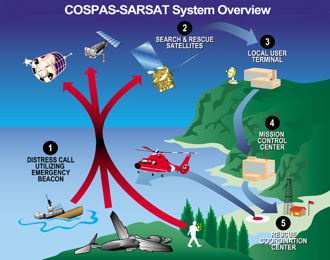 The greatest aid to both searchers and those needing to be rescued is the Cospas-Sarsat system. This is a system of satellites orbiting the Earth combined with ground stations which are designed to provide distress alerting and location data to assist search and rescue (SAR) operations. This is accomplished by receivers on the satellites which detect and locate the signals of distress beacons operating on a frequency of 406 Megahertz (MHz). The position of the distress and other related information is forwarded to the appropriate Rescue Coordination Centers (RCCs) through the Cospas-Sarsat Mission Control Center (MCC) network. 1. Distress radio beacons (ELTs for aviation use, EPIRBs for maritime use, and PLBs for personal use) which transmit signals during distress situations. 2. Instruments on board satellites in geostationary and low earth orbits which detect the signals transmitted by distress radio beacons. 3. Ground receiving stations, referred to as Local Users Terminals (LUTs), which receive and process the satellite downlink signal to generate distress alerts. 4. Mission Control Centers (MCCs), which receive alerts, produced by LUTs and forward them to Rescue Coordination Centers (RCCs), Search and Rescue Points Of Contacts (SPOCs) or other MCCs. The Cospas-Sarsat system is currently comprised of two types of satellites, Low Earth Orbit (LEOSAR) and High Earth Orbit (GEOSAR). Low Earth Orbit satellites are placed close to the Earth, this coupled with the speed they need to circle the earth in order to stay at a constant altitude, causes them to rapidly fly over the terrain below. High Earth Orbit satellites because they are so much higher in altitude move at a speed in relation to the ground below which causes them to remain stationary over one spot on the Earth. Low Earth Orbit Satellites orbit the Earth in near-polar orbits. They provide complete, yet non-continuous coverage of the Earth. The non-continuous aspect of the coverage occurs because the polar orbiting satellites can only view a portion of the earth at any given time. Consequently the System cannot produce distress alerts until the satellite is in a position where it can “see” the distress beacon. However, the satellite’s onboard 406 MHz processor includes a memory module, the satellite is able to store distress beacon information and rebroadcast it when the satellite comes within view of a ground station, thereby providing global coverage. A single satellite, circling the earth around the poles, eventually views the entire surface of the Earth. 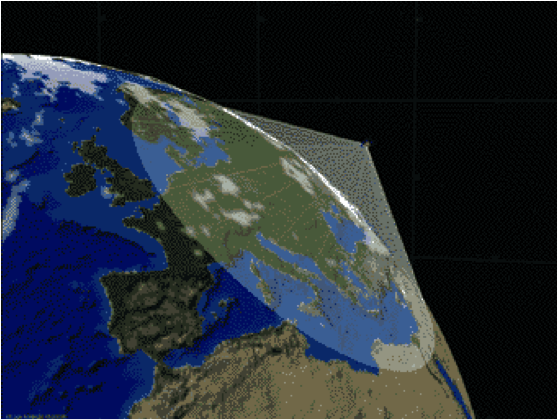 Low Earth Orbit Satellites calculate the location of distress beacons using Doppler processing techniques. Doppler processing is based upon the principle that the frequency of the distress beacon, as “heard” by the satellite instrument, is affected by the relative velocity of the satellite with respect to the beacon. By monitoring the change of the beacon frequency of the received beacon signal and knowing the exact position of the satellite enables the calculation of the beacon location. Each satellite makes a complete orbit of the earth around the poles in about 100 minutes, traveling at a velocity of 7 km per second. The satellite views a “swath” of the earth of approximately 6000 km wide as it circles the globe, giving an instantaneous “field of view” about the size of a continent. When viewed from the earth, the satellite crosses the sky in about 15 minutes, depending on the maximum elevation angle of the particular pass. High Earth Orbit Satellites carried on board various geostationary satellites. Because a high earth orbit satellite remains stationary relative to the Earth it has a continuous view of the terrain below enabling immediate alerts upon distress beacon activation. Unfortunately because the satellite does not move in relation to the terrain below there is no Doppler effect on the received frequency, and Doppler radiolocation positioning techniques cannot be used to locate distress beacons. Position information must either be acquired from the beacon though an internal or an external navigation receiver (GPS) and encoded in the message sent by the beacon, or derived, with possible delays, from the low Earth orbit satellite system. There is one significant advantage of buying a beacon with a GPS receiver. These emergency beacons determine their location using a GPS receiver that is either integrated into the beacon (called a location protocol beacon) or fed by an external GPS receiver. This accurate location information (generally around a football field in size for positional accuracy) is then encoded into the 406 MHz signal that is transmitted by the beacon. The satellite then receives that signal with the location and forwards the location. This information can often be derived in a matter of minutes! Since every second counts in reaching the scene of a distress this means that there is an increased chance of survival. 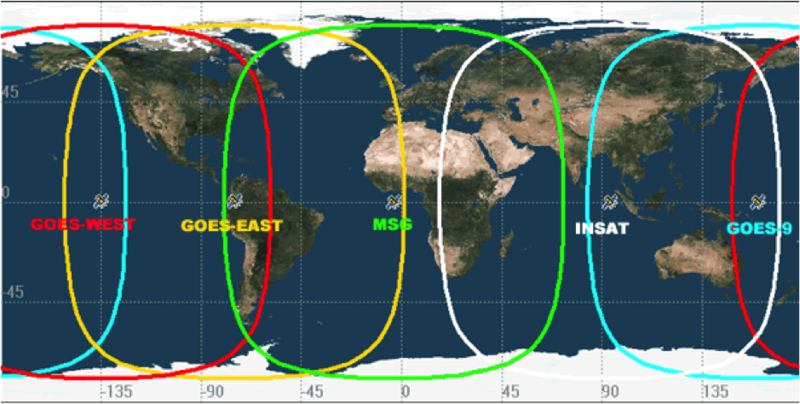 High Earth Orbit Satellites are “parked” over the indicated positions and have a continuous view of their respective color coded line of sight areas. Low Earth Orbiting Satellites can provide position calculation on distress beacons which do not provide their GPS location, but a satellite has to pass over to hear the beacon. Remember Low Earth Orbit Satellite coverage is not continuous so delays in picking up a beacon are possible and it could take several satellites passing over before a accurate position is determined. High Earth Orbit Satellites provide instantaneous detection of distress beacons in their field of view but cannot determine location on its own. The distress beacon must send an encoded GPS location to be forwarded to rescuers. The LEOSAR and GEOSAR satellites are complimentary systems. Each type of satellite is able to help fill the others blind spots. While low Earth orbit satellites pass over areas every hour and a half or so the high Earth orbits are always watching. When distress beacons like PLBs are in an area where a satellite in high Earth orbit can’t see due to the angle or obstructions a low orbit one will pass over in time. This site recommends that you buy a PLB with GPS capability! How do I test my Personal Locator Beacon?